MAGIC BOX JP CO., LTD., which is a design firm specifically designing for the motorcycle industry and the advanced composite industry. Magic Box JP is an award winning company, specifically designing for the composite industry. In 2007 our design was selected as a winner, by the International composite design competition supported by JEC. In 2008 our fabric display stand utilizing the inherent characteristic of carbon fiber was nominated at the, BIO21, international design competition in Slovenia. The MAGIC BOX JP founder is an industrial product designer who has roots in Magical Racing. He has designed and developed many creative products from the Magical Racing time. For instance, Magical Racing stepped screen with CFRP, Racer Replica mirrors, etc were his designing products. 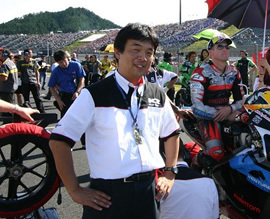 Magical Racing is revered in Japan as the most famous and best composite manufacturer for the Japanese motocycle industry. They are making bodywork for factory Moriwaki, Yoshimura racers to name a few. Other than Magical Racing bodyworks, MAGIC BOX JP has strong relationship with other category manufacturers, such as KABUTO Helmet (helmet), K-FACTORY (exhaust), Beater (aluminum tank) and HEAT-MAGIC (swingarm). We know that all our partner manufacturers are the finest maker in the world, and want everyone to be able to experience the beautiful craftmanship and the highest technologies that Japanese are famous for. We are very proud of the products we supply, and believe them to be the finest available for you and your treasured machine. MOTO-WORKS.JP mission is to bring you the finest motorcycle components from Japan, with the finest customer service, and make your experience the finest memorable one page in your motorcycle life.